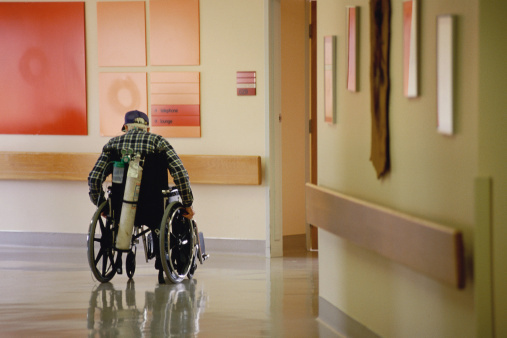 Who Should Nursing Home Negligence Be Reported To? Elderly man in nursing home. Leaving your aging loved ones in the care of a nursing home can be very stressful for you and your elderly relatives. These are family members who have guided you and your family through the good times and the bad. They were there during your first break up, your first job, and dispensed their loving advice freely. It is only right that after all they have done for you and your family that they are offered the same loving care in their later years when they are no longer able to care for themselves. Unfortunately, negligence and nursing home neglect is often overlooked when finding a suitable retirement home for your loved one. According to CBS News, nursing home abuse is on the rise and happens far more often than many would imagine. Nursing home negligence can lead to the deterioration of the health of the residents and in extreme cases it can even end in death. The most common form of negligence in a nursing home happens when the elderly resident is neglected. This kind of abusive neglect may happen when the person is left without help in performing personal hygiene tasks such as grooming, bathing, and changing into clean clothes; elderly persons may also be left without proper nutrition, hydration, and lack of proper medical care. The first stage of getting help for your loved one is expressing your concerns with the director of the facility you are at – if the facility is reputable they will investigate the situation and make reprimands to the responsible party/parties. If the situation continues you can make a formal complaint with your state’s department of health. For information on your state’s reporting system, check the information on The U.S. Administration of Aging’s website. Thank you so much for this information! I believe my mom is being treated poorly in her nursing home and I am interested in our options for addressing this.